I’ve just discovered that USCFSales.com has a few of this little beauty left. Chess Tiger 15 is one of my two favorite chess engines released by ChessBase because of the way Tiger plays. While most chess engines avoid making material sacrifices (unless it’s for an immediate return, like a mating combination or the winning of extra material in another move or three), Chess Tiger is programmed to actually look for sacrifices, sometimes even making speculative ones without concrete proof of a return on the material investment. This makes Chess Tiger a ball to play against, and when used for analysis Tiger will sometimes find tactical possibilities that other engines miss. I was saddened when no new versions of Tiger were released; version 15 is now several years old. But we’ve discovered that we do still have some of these in stock, and for chess engine collectors or for players who want to see a style of play which is really different than what they’re used to from a chess computer, I can’t recommend Chess Tiger highly enough. The interface of this version, by the way, is the same as (I believe) Fritz8 or Fritz9, and the software’s interface will have the same functions as that version of Fritz. For users of more recent versions of Fritz, Rybka, etc. the Chess Tiger engine will run in your current software, giving you the same features as the current version of the Fritz interface. So please don’t miss this chance to own one of the most unique chess playing engines ever produced. 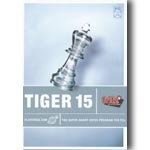 Chess Tiger 15 will always surprise you with the tactical resources it spots and the tricks it carries up its digital sleeve!